Together with our partner organizations, we are committed to ending traffic deaths in San Diego. 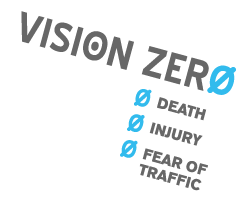 We are joining Circulate San Diego and a diverse group of community groups is urging the City to commit to a Vision Zero policy to eliminate traffic deaths in San Diego in the next 10 years. Chicago, San Francisco and New York City have already committed to this goal, implementing a broad array of programs to coordinate engineering, enforcement, and education aimed at safer streets. We will be calling on the agencies below to commit to implementing a vision to reducing traffic fatalities to zero in 10 years. This page will be updated with more information. Learn more about the original Vision Zero campaign.